Delegate: Mr. Luca Benedetti , Gestore dei Servizi Energetici - GSE S.p.A..
At the end of 2018, Italy presented to the EU Commission the draft of the National integrated Energy and Climate Plan (NECP), setting challenging energy and environmental targets for 2030. NECP was presented by the Ministry of Economic Development, the Ministry of Environment and the Ministry of Transport and Infrastructures, but it was prepared with the collaboration of various high level technical and research bodies. Renewables are expected to grow remarkably, getting to very high levels of penetration in the electricity sector, above 50%. A key role will be played by mature technologies such as photovoltaic and wind plants, which will be promoted through competitive mechanisms and regulatory actions. However, innovative and promising technologies, including marine, are also encouraged to give a contribution to 2030 targets. In that context, the NECP draft announced that ad-hoc measurements will be put in force for such innovative technologies. The cluster “Blue Italian Growth” (BIG), led by the Italian National Research Council (Consiglio Nazionale delle Ricerche – CNR), has continued its progress towards the establishment of an open structure for the aggregation of all the national actors involved in all the different sectors of the Blue Economy, including Marine Renewables. Sectoral Action Plans have been developed, and are currently being finalized. While waiting for the measurements foreseen by the new Italian NECP, D.M. 23/06/2016 was the latest operative support scheme, currently in force. The Decree updated the support scheme previously regulated by DM 6, July 2012. The latter reviewed the preceding framework based on Feed-in Tariffs and Green Certificates, for renewable plants (other than Photovoltaic) in operation starting from 1 January 2013. The most recent DM identifies four different ways of access to incentives: direct access, bid auctions (Dutch Auctions), registries for new power plants, for fully reconstructed power plants, for reactivated, empowered and hybrid power plants and registries for rebuilding intervention. The Decree defines the criteria to access the registries and the Dutch Auctions and establishes specific limits for the annual capacity eligible to incentives. These limits are set up differently for each kind of renewable energy source and for all the different ways of access to incentives (registries or bid auctions). In general, the Decree grants a fixed tariff plus, in some cases, a specific premium, to provide incentives to net electricity fed into the grid. The fixed tariff is different according to each source, technology, and capacity range considered. Power plants with a capacity > 500 kW can only receive the incentive (fixed tariff minus electricity hourly zonal price, plus premiums if foreseen). Power plants with a capacity ≤ 500 kW can alternatively receive a Feed-in Tariff composed by the fixed tariff plus, in some cases, a specific premium. In the Dutch Auctions, the maximum requested value of the tariff cannot be higher than a 2% discount of the reference value and the minimum value cannot be lower than a 40% discount of the reference value. The incentives last for the average conventional plant life of each typology of power plant. All the support schemes are managed by the Italian Energy Service Operator (Gestore Servizi Energetici - GSE), the body in charge of managing all the incentives to renewable energy. New, fully reconstructed, reactivated or empowered wave and tidal energy power plants can access directly to incentives if their capacity is not greater than 60 kW, otherwise they must apply for access to registries. The direct access to incentive was in force up to the end of 2017, but no plant has benefited from this incentive. 1If the power plant is built by the Public Administration, the maximum capacity eligible to direct access is doubled (120 kW). From 2013 to 2016, the total annual capacity (MW) eligible for access to registries, and therefore for the granting of incentives, amounted to 6 MW. To this day, only one project, with capacity of 99 kW, located in Tuscany, retains the right to access incentives, but it has not been realized yet. The Decree does not provide for Dutch Auctions in the case of wave and tidal energy power plants. The Directive 2014/89/EU on Marine Spatial Planning is also relevant for the specific Blue Energy sector, as it establishes a framework for the implementation of maritime spatial planning and integrated coastal management by Member States, aimed at promoting the sustainable growth of maritime economies, the sustainable development of marine areas and the sustainable use of marine resources. The Directive has been recently transposed into the Italian legislation via the D. Lgs 201/2016. Italy relies on a public research programme aimed at maintaining and improving the national energy system, including the still limited marine energy sector. Such programme, named Ricerca di Sistema (System Research), pursues as its main objective the promotion, organization and management, of basic and industrial research, and of the related technological development, finally ensuring maximum fruition of results to all citizens and end users. The Committee of Research Experts for the Electricity Sector (Comitato di Esperti di Ricerca per il Settore Elettrico - CERSE ) plays a strategic role in orienting R&D activities towards the innovation of the electrical system, through funding under the EU principles that regulate State aid for Research and Development and Innovation. (Communication from the Commission 2014/C 198/01). The CERSE is composed of five members, appointed by the Minister of Economic Development, and is responsible for regulating public funding for research projects of general interest in the electricity sector. Decree N. 1610/3 August 2016, for the recognition and the subsequent development of four national technology clusters aimed at coordinating public and private research initiatives, as well as national governance and territorial policies, in accordance with the representatives of major national enterprises. One of the clusters is dedicated to the Economy of the Sea, with specific reference to Blue Energy as one of the fields of interest. Among these, potentially connected sectors are also explicitly mentioned, such as shipbuilding, environmental monitoring and protection, aquaculture and blue biotechnologies. Applicants, constituted as competing consortiums, were requested to formally authorise a representative selected among their members, in the form of an individual authorisation, and to further substantiate their initiative by presenting an Action Plan and two original industrial research projects. Applications have been assessed according to the quality of the proposed Action Plan and projects, and the evaluation results published in the Directorial Decree N.1853/26-07-2017. The cluster “Blue Italian Growth” (BIG), led by the Italian National Research Council (Consiglio Nazionale delle Ricerche – CNR), has been granted access to financial support, while the Blue Energy project TEOREMA (Technological Solutions For Multi-Objective Off-Shore Energy Platforms), ranked first in its category, is to enter into negotiation. Decree N. 1735/13 July 2017, a call for proposals targeted at projects focused on industrial research and experimental development in the 12 areas of specialization individuated by the Italian National Research Programme (Programma Nazionale per la Ricerca – PNR) 2015-2020. The strategic areas include Blue Growth, and Blue Energy is explicitly mentioned as a relevant sector. Such initiatives are expected to contribute to the rationalization of the Italian activities in the Blue Energy field, and to systematically support the so far isolated efforts of the national actors, amplifying their collective impact by connecting different economic sectors, as well as relevant stakeholders from the business community, the government and civil society, thus also helping to create a systematic framework of rules and incentives. As a matter of fact, the Italian research community has so far resorted to a variety of independent public funding sources, either national or international, which, albeit significant in terms of prestige, do not guarantee the constant, coherent and predictable support required to fully exploit the Italian potential and to consolidate Italy’s position in the international market. All the actors from the private and academic sectors that were already included in the 2017 Report are actively involved in R&D activities to further improve their devices, increase their technology readiness level (TRL) and lower their levelized cost of electricity (LCoE). Here we only present cases of substantial upgrade and relatively high TRL. 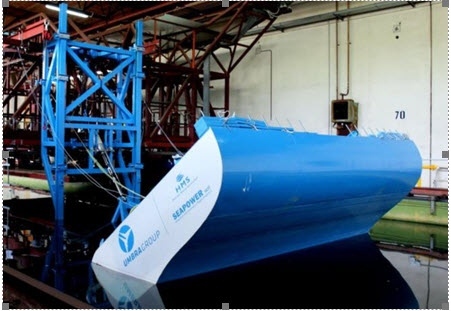 The University of Naples “Federico II” has a long-standing experience in the design and testing of tidal energy converters. The university spin-off SeaPower scrl, a non-profit private consortium that already patented new marine energy converters, is now bound to implant a natural laboratory offshore Villa San Giovanni (RC), for the development, optimization and monitoring of innovative devices for the exploitation of tidal currents. Its location in the Strait of Messina is ideal for the significant intensity of local currents and the extremely favourable climatic conditions offered throughout the year, two requirements that are rarely simultaneously met in the Mediterranean Sea. The authorization process for the construction of the laboratory is in progress: the Environmental Impact Authorization has already been granted and the detailed project for the onshore infrastructures has been submitted to the Ufficio del Genio Civile OO.MM. (Civil Engineering Department, Coastal Operations). The official permission for building is expected to be granted soon by the Municipality of Villa San Giovanni, and to be immediately followed by the necessary Public Maritime Domain concession. Due to the peculiar hydraulic characteristics of its location (Punta Pezzo), the SeaPower laboratory will represent a unique facility in the Mediterranean, offering the opportunity to test both full scale and reduced scale prototypes in a fully monitored natural environment. The laboratory will consist of five areas, permanently designated for the monitoring and testing of prototypal turbines, of a test area on the existing artificial pier and of an onshore laboratory to host the related infrastructure assets. An additional artificial breakwater will be built in the proximity of the marine test areas for logistic support to operations at sea. Submerged cables will connect the converters at sea and the monitoring equipment to a submarine hub, from which a single cable will carry both the electric current produced and the acquired data to the onshore lab. The PIVOT system is a Wave Energy Converter (WEC) that consists in a hinged floating body oscillating under the effect of wave motion and an electric generator, connected via high-tech components. It has been developed from the GEL prototype by Seapower scarl in collaboration with the University of Naples “Federico II”. The shape and inertial characteristics of the floating body have been specifically designed, as well as the structure that fastens it to the rotating axis connected to Power Take-Off (PTO) system. The conversion of mechanical energy can be achieved through a variety of technical solutions. The PTO currently consists of an electric generator coupled to a recirculating-ball screw that was designed in collaboration with the manufacturer, Umbra Group Spa. The PTO is connected both to the oscillating body (via a piston and a hinge) and to the fixed structure. Wave motion forces the system to oscillate and induces the consequent rotation of its hinged axis, which results in the linear oscillation of the piston that is finally transmitted to the generator via the recirculating-ball screw. Both reduced scale and full scale prototypes of the system have been tank tested, reaching TRL 5. 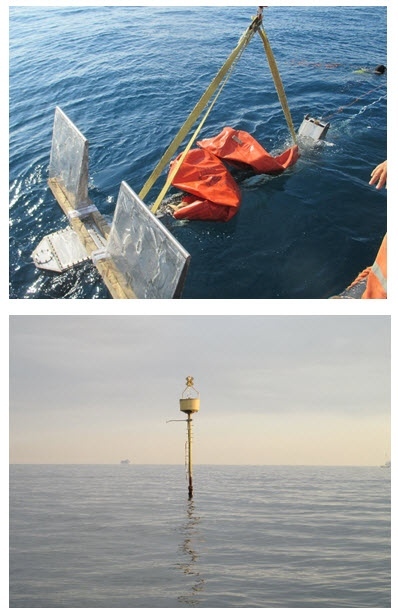 Testing in real sea conditions was scheduled for December 2018, when a full scale PIVOT prototype using the described system configuration was to be anchored onto a breakwater in the port of Civitavecchia (Roma). The PIVOT concept can be exploited in different configurations, by using alternative PTOs or by adapting the mobile and fixed structures to specific requirements. In particular, a system based on an oscillating floating body is currently under development, in which the mechanical transmission of motion to the generator is achieved via an innovative system that reduces the criticalities deriving from the alternating wave-induced motion. The new configuration will be designed for both offshore and onshore installation, so as to expand the range of its possible uses, and to minimize the risk of disruption from extreme waves to which onshore plants are exposed. Future activities are expected to bring the PIVOT system to a higher TRL. The E-WAVE 100 converter consists of a dual chamber Oscillating Water Column (OWC) device, designed for being integrated into vertical wall breakwaters. The two chambers that constitute the device act in charge/discharge mode respectively, and are both equipped with specifically adapted non-return valves. In particular, wave motion causes sea water to rise to a level higher than the external mean sea level in the first chamber, which is equipped with free-flow valves allowing the free passage of the inward flux. Inside the second chamber, in its turn equipped with free-flow valves allowing the free passage of the outward flow, the water level is lower than the external mean sea level, and the resulting hydraulic potential generates the water flow in the duct that connects the two chambers. Electro-mechanic conversion is achieved via a low-head hydraulic turbine. The E-WAVE 100 converter is characterized by minimum installation costs, low maintenance costs, scalability and modularity, as its simple structure can be constructed by using commercial components and materials that are easily available. 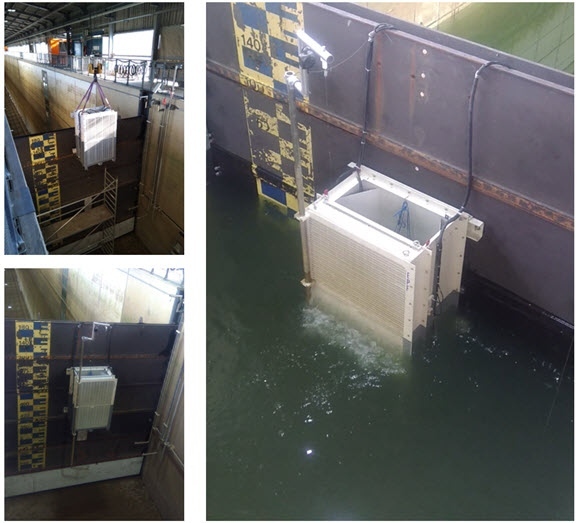 A reduced scale (1:20) model was tested in the Aalborg University tank in 2017, while in 2018 the 1:2 model was tank tested in the Large Wave Flume (GWK) of Hannover University, in the context of the MARINET2 EU project. The IMPETUS-UNIPA device was developed and patented by the Department of Energy, Information Engineering and Mathematical Models (Dipartimento Energia, Ingegneria dell'Informazione e Modelli Matematici - DEIM) of the University of Palermo. It is a point absorber that consists in a cylindrical body containing a linear electric generator. The stator is integrated into an inner cylinder while the rotor is connected to an external cylinder that moves along with vertical wave motion. The PM electric generator is an innovative device used to convert mechanical energy into electricity. This new technology offers the advantage of being free from any polluting additives, and can therefore be considered to be completely “clean”. The ECOMar system by Kuma Energy is a Wave Energy Converter that can be integrated into any vertical structure and installed on any seabed. It is modular and can be upscaled from installation of a few KWh (e.g. small touristic harbours) to very large plants. ECOMar is a versatile hybrid system that combines a hydraulic and an electromagnetic converter, allowing energy production at both low and high frequency and for different wavelengths. It integrates a system for environmental monitoring, in order to automatically be switched off in case of extreme sea conditions, and is designed to be completely harmless for vessels adrift, as its floating body acts as a robust fender. ECOMar can be easily equipped with a system for the collection of plastic or other floating waste. The ECOMar system is comparatively low cost, as it uses standard components that are easily available on the market, and it is designed to also minimize management and maintenance costs. A 1:8 prototype has been tank tested in the AM3 spin-off laboratory of the University of Florence, while a pilot plant is under development. Seaspoon is an innovative submerged device designed for offshore applications. The system exploits the orbital trajectories of near-surface seawater motion, by automatically aligning its rotation axis with that of the orbit, perpendicular to that of wave propagation. Its depth can be modified according to the projected wave energy density, a characteristic that also allows protecting the device in case of extreme sea conditions. The Seaspoon was patented by the Thermochemical Power Group (TPG), a spin-off of the Technical University of Genoa) (Italian patent 1405004 GE2011A000020), after being tested in real sea conditions offshore Genoa. Future activities include the improvement of the electric generator, and are expected to bring the device to TRL 6-7. The installation of offshore wind farms in the Mediterranean has been so far hindered by the characteristic depths of the basin, which do not allow fixed foundations for the turbines at a distance from shore that is at the same time compatible with landscape preservation and cost effectiveness. However, after the final judgment of the Administrative Court on the lawsuits originated by adverse public opposition that caused substantial delay, the first near-shore plant is currently under construction in Taranto, Italy, with 30 MW total capacity (https://www.4coffshore.com/windfarms/parco-eolico-nella-rada-esterna-del-porto-di-taranto-italy-it31.html). The wind farm is owned by RENEXIA, a company of the Toto Group, and has 30 MW total nominal power, generated by ten turbines, 3 MW each. The connection to the distribution grid is scheduled for 2019, by the end of the summer. Both the PELAGOS and MAESTRALE Interreg Projects (both already presented in the 2017 Report, https://pelagos.interreg-med.eu/, https://maestrale.interreg-med.eu/) implemented pilot actions at both regional, national and transnational level, aimed at easing the involvement of Small and Medium Enterprises (SMEs) in the marine energy sector and at developing a strategy for the deployment of maritime energy in the Mediterranean area. an international B2B Event for enterprises active in the sector of marine renewables (“Match-making Blue Energy actors”, https://pelagos-2018.b2match.io/page-2401). In addition, the Blue Energy Cluster Web Platform (http://be-cluster.eu/) has been launched, aiming to provide continuous and sustained support to organizations and enterprises that are active in the field of marine renewables or intend to explore the opportunities it offers. On the other hand, the MAESTRALE Project organized a number of international events in several locations abroad, which are listed on the Project website: https://maestrale.interreg-med.eu/.